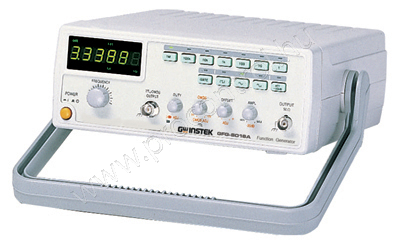 The GFG-8216A is a 3MHz analogue function generator with TTL/CMOS/Ramp output, External Voltage Controlled Frequency (VCF), as well as a built-in 6-digit counter as standard. Using dial knobs and buttons and a clear LCD display for signal generation, the GFG-8216A is simple and easy to use. All these integrated and user-friendly functions of the GFG-8216A are made to accommodate applications in audio response testing, vibration testing, servo system evaluation and ultra sound applications, etc.